Click HERE to see complete Tilt Cart gallery. Topper Industrial (www.topperindustrial.com) is a leading material handling cart manufacturer. The new photo (Ref: CT298 ) is of a six wheel 45 degree tilt cart. Topper Industrial engineers many different types of Tilt Carts. 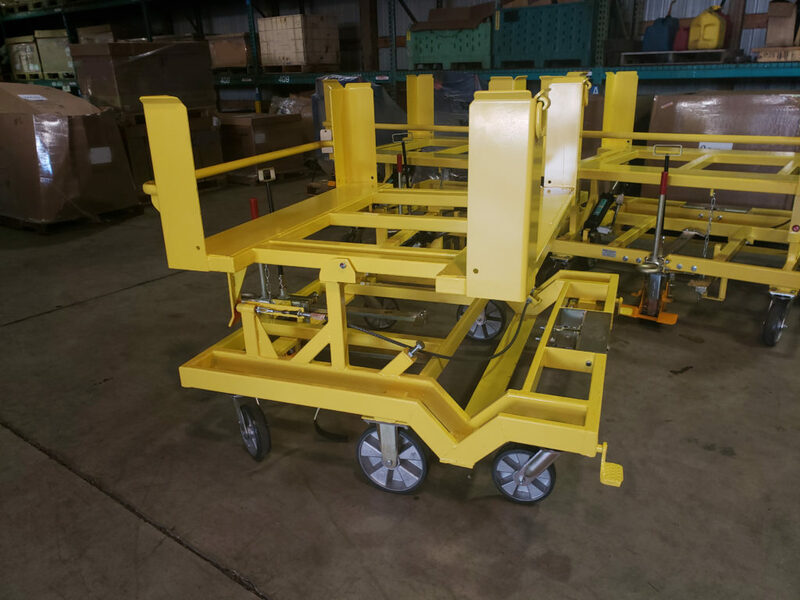 Tilt Carts create a safe, controlled and ergonomic delivery work station line side. This cart was designed with the tilt control on the operator’s side. A Tilt Cart is a rugged industrial cart consisting of a unique upper frame that is designed to fit a specific container size and is able to tilt to a desired angle. The pictured Tilt Cart tilts to 45 degrees. Topper Industrial’s tilt carts come equipped with a patented adjustable closed loop hydraulic cylinder that controls the energy of the load as it is tilted. It provides for a safe and controlled tilt movement in a full to empty application. This tilt cart is a six wheel design providing optimal maneuverability and easy tracking. This cart is equipped with Topper’s RS Casters. For more information, please contact Topper at sales@topperindustrial.com.